Using a motorcycle means you have two options, namely with Xe Om or motorcycle rental. Xe Om is a fairly common transport in Ho Chi Minh City and other major cities in Vietnam. In the backpacker area you will often hear “You want to moto?” Xe Om is safe and cheap. after 2007, all passengers of motorcycles in Vietnam are required to use helmet.If you want to ride Xe Om, make sure helmet gives by riders. If he only had one helmet, better find other Xe Om, as if caught by the police, then you should pay a fine. Agree cost of Xe om ahead. Just as expected, rates for short distances not more than 20000 Dong. Fare to the airport around 40000 Dong. Xe om arguably half the cost of a taxi fare. So if you are a solo backpacker, Xe om could be the first choice around, in addition to the bus. If you choose to rent a motorcycle, in the Pham Ngu Lao area many rental places. 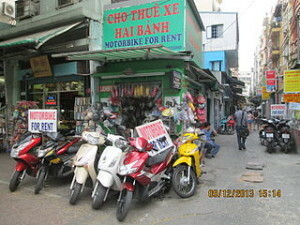 With 110000 Dong, you can rent a 100 cc motorcycle. there are a few tips on a motorcycle in Vietnam. you must have experience riding a motorcycle in filled and irregular traffic. If you feel less experienced, or lack of confidence, it’s worth renting an automatic motorcycle. Always wear a helmet and do not leave the motor at any place, looking for parking with guards. Cyclo is a kind of rickshaw which is very suitable for driving around town, look at the activity going on around us. Cyclo moving very slowly. Be careful with your belongings, such as bags or cameras because of frequent theft of cyclo passengers carried by motorist. You must agree Cyclo fare before boarding. Make sure you mention the obvious dengna your destination. If not, it could be the driver to bring you to a restaurant or store that benefit themselves. It is a tourist favorite way when touring a foreign place. In addition to saving, travelers walk very freely to a stop in a place that you can take photos, observe the locals, and so on. One of the advantages of being in a city with high traffic density such as in Ho Chi Minh City is the latest spur motor vehicle. It’s certainly easier for the pedestrians, especially on roads without sidewalks. Naturally, with the dense vehicle, walk down the road without sidewalks still dangerous. Another thing to consider is how to cross the street. For foreign tourists, this is a nightmare. Crossing the road is very difficult, especially in the middle of the road without traffic lights. In my opinion, it is even more difficult than crossing the road in other southeast Asian countries. If there is a security guard dressed as a green tourist, you can ask him to be ferried. If there are local people who want to cross over, you just need to follow from behind. It feels strange to discuss how to cross the street. However, many tourists have experience, this is quite important. The point is you have to stay alert, walk slowly, but confidently. Although seen passing motorcycle. Virtually all of the riders are already accustomed to avoid the pedestrian. The biggest problem is for the pedestrian traffic order in Vietnam was very severe. Most do not obey traffic signs. Even if the red light was still on, they kept going. Therefore, you must look in all directions to ensure safe conditions. Other problems are often running motorcycle on the sidewalk. The sidewalk is often used as a parking lot and the street. Traffic police also seem not care about this. however, Of course wrote a lot of places in Saigon, is still quite safe walking. As he walked toward the goal, you can see various interesting activities, such as traders in the shop who are cooking, the locals were eating pho, cyclo artisan who was sleeping, and so on.